The Tucson Homeskillet: A Grand Day Out With The Tucson Homeskillet! The wife has been out of town for almost a month and I really haven't left the house since she left. It's odd. Being joined at the hip like we are, when she goes to train new bartenders in various locations across the US, maybe once twice a year for a few weeks, my first inclination is to get a bunch of stuff accomplished. The reality of it all is the first week she's gone I live in almost silence and seclusion. I love her more than anything but she can be quite the tornado of clothes anywhere and everywhere, towels strewn about, shoes left in the middle of walkways and lord almighty if I can't just get a corner of the comforter when she literally coils herself up in a blanket ball from her night spinning much like a thrill seeker barrel rolling down a steep hill. So the first week I clean the house knowing it will stay clean, take as many naps as possible, listen to Metal at top volumes alongside not saying a word and just enjoying the tinkling of garden chimes and the cat purring. Around the second week I start watching movies and shows I wanna watch and possibly have one too many to drink at night as trying to sleep without struggling for a bit of sheet only makes the bed feel empty and the house somehow bigger and darker. The third week I sort of get into this groove of "being alone" and before you know it she's back and all is right with the world. Well, our little world anyway. The Wednesday (my one true day off during the week) before she returns, I decided to make a journey of it. 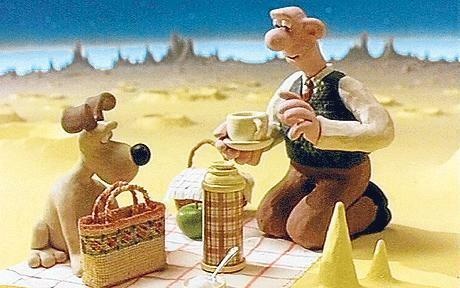 Getting inspired by Wallace and Gromit and their "Grand Day Out" where they go to the moon to get more cheese and then are accosted by a skiing enthusiast robot oven, I too wanted to eat and do something around Tucson that I have been meaning to get on with. So I made a list, set a course and when I woke up at the crack of noon I got in the car and began my adventure. So here are the results of a most recent Homeskillet outing. Was it grand? Some points. But a few snags only made a beautiful late winter afternoon as close to perfect as one could hope for. What used to be El Mezon del Cobre (a fine place to eat and grab some beers while we did laundry next door at this little wash shack called Dean's Village Laundromat) is now a nautical themed Mexican food establishment that boasts some of the best and most inventive seafood fare in the neighborhood, if not the city. I mean, the outside is built to look like a submarine and when you walk through the port like doors, you enter a fairly dark and blue hued underwater themed submersible bar and restaurant, one that you might find in some overpriced water park. It was late afternoon so the lunch rush had already come and gone. Sure there were a few people in there but when I was sat at one of their large tables in the middle of the action, I had a feeling that I was in for something good. In the center of the long plank-like table are a bevvy of various hot sauces and along the curved walls large flat screens display the specialties of the house all keeping with the undersea motif. This place is pretty cool. Scanning the menu, I instantly became a bit weary of the prices. Tacos and tostadas ranged in price from $8 to $20. For a taco? In Tucson? So I asked my server what the portions were like and with a gesture of his hands as if he were holding a football, he assured me that the food here was very generous. "Trust me," he said with a smile, "they are like no taco you have had before." So I ordered a taco and a tostada. He then looked at me and asked "For...just you?" This made me nervous. Did I order too much? The tone of his voice indicated that perhaps my appetite wasn't as big as the food here. I then assured him that I "just wanted to try a good variety" and, yes, I will need a to go box. But I was so hungry I knew that I could devour all the food I just ordered. It couldn't be that big...could it? First up was some chips and salsa but....this wasn't your average free dippin' sauce you expect in a Mexican food joint. This wasn't made with tomatoes, but rather tropical fruit, peppers and, get this, soy sauce. I had to ask because when I dunked my chip into it and took a bite I was overtaken by flavor. Simple, beautiful, fresh and imaginative. Seeing my pleasure of just sampling the salsa, he kept bringing out more for me to try. Each one was wholly different and textural from the next. Some hot, some thin, some bright, some dense but all delicious. Soon my first item arrived. It was the Chile Relleno taco which was described as a jalapeno filled with cheese and shrimp, topped with a cabbage salad, cilantro guacamole with a creamy chipotle dressing and pickled onions. Upon first view of it, yes, my server was right, this is a very shareable taco. It was big. But I braved the sheer mass of it all and dug it. Glorious. Absolutely filled with layers of flavor, balance of heat, crunch, savory and creamy that all came together in a wonderful array. He was right, I hadn't had a taco like this before. The La Berraca tostada features salmon, shrimp and scallops on thick warm corn tortillas in a sea of ranchero essence sauce. Now, I haven't had thick corn tortillas like this since my time living in southern California or various trips to Baja. Everything about this dish was amazing. So fresh, so clean and so considered and thought about. At this point I began to get a little light headed from all that was going on in my mouth and stomach but I trudged on and actually finished the La Berraca tostada. But between the thickness of the Chile Relleno taco, the chips and the samples of salsas and the fact that I still had a full day ahead of me, I did indeed ask for a box for the remaining taco. Note to all readers: always trust your server! 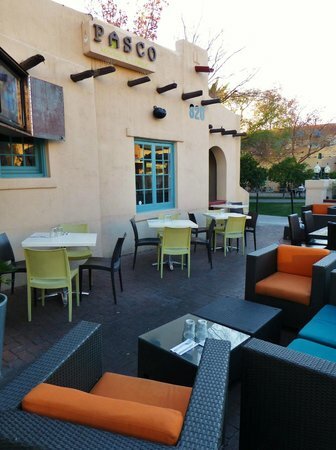 El Berraca is new but is easily on it's way to becoming a food destination here in Tucson. Owned by the same team that runs the BK franchise, this place is now something that I treasure and fear in my neighborhood. Treasure because...oh my god! Fear because...oh my god, am I eating here again? Like I need a taco habit to aid in my already expanding middle. Whatever. When I left I was so elated that I considered going up a few blocks to the house, cuddle up with the cat and take a nap. But...no. I still had four more places to go so off I went. I've been wanting to try this deli ever since going to Ermano's next door but never stepped foot in there even though its open later than most delis. Now, if you've read other Homeskillet posts you know how deli obsessed I am. Seeing how rare it is to get me to come down to 4th Ave, or even downtown, I thought the Hopyard Deli must be awesome because the decent reviews and accolades are coming in from all sides. Well, I must have caught them on an off day. It was late afternoon and the place was empty. It was nice, clean, seemed like a great location to stop in for a soda and sandwich but there was nobody there. Like...nobody. Not even an employee behind the counter. I couldn't even hear anybody prepping or cleaning or...anything. So I looked around, decided to get some pastrami to go and then waited. Maybe it was self service, I don't know. After about ten minutes or so of just standing there and looking into the cameras hoping someone would see me, two teenage kids slowly emerged from the back and just sat on a table checking their phone. I had to ask, "Uh, do you work here?" The girl with the blonde dreads and stoned eyes walked behind the counter and just looked at me. The other dude in the Bonnaroo t-shirt just sat there not even acknowledging anything. So I hesitantly ordered some pastrami, which seemed like an absolute chore for her, then the dude slid off the table, rang up my order and had problems running my card because the iPhone thing was "acting all stupid". What should have taken a minute or two was like a twenty minute ordeal. Plus it was getting close to 4pm and I didn't want to be late for my next appointment, which started at exactly 4 and if you don't get there on time...the merchandise goes quick. In silence and non appreciation, I was handed my stack of cut meat and I dashed out the door to my next destination. Thanks Hopyard, now I know: Just stick to the Sausage Shop and all will be well. Plus the pastrami was bullcrap. 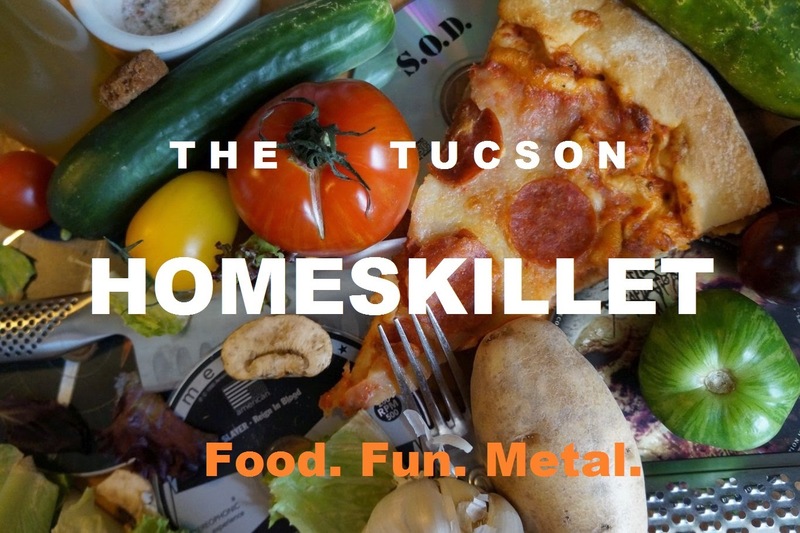 When I re-started the Tucson Homeskillet almost two years ago and totally immersed myself in the local food scene, one of the first people to friend me and who I started to follow back was Don Guerra. This alchemist of local grains and flour creates some of the tastiest bread I have ever had the privilege to put in my mouth. 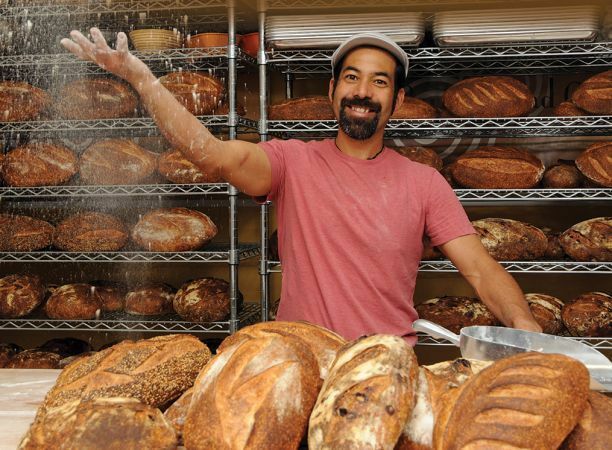 Working out of his garage, Don is a one man flurry of baking, spawning delicious loaf after delicious loaf and sells his wares across Tucson at random locales, usually schools and community areas. On this particular Wednesday, he happened to have a stand set up at the Community Supported Agriculture center courtyard on University Avenue. I got there at exactly 4pm and there was already a line. After staking my place in the que while checking out the amazing goods for sale, I had a horrible thought: Barrio Bread only takes cash on outings like this, and I hadn't been to an ATM in quite some time. Crap. Thing is, I rarely carry actual money with me, so I dug out my wallet and opened it up, praying I had at least a few bucks. Luckily there was a 10 in there...whew. Not enough to buy one of each but at least to grab two of my favorites, the the Pain Epi baguette and the au Levain loaf. What can I say, if you have never experienced what real bread tastes like, you have no idea. Follow Barrio Bread online and track them/him down. Authentic bread is honestly one of my favorite things to eat. You think it's so simple, and, in reality, it is, but it is so much more. So complex, a living thing that is nearly almost all air, but it's science so... I hate to use this word, but the flavor is transcendent. Yes...I said "transcendent". After the disappointment from the deli, the two loaves I was lucky to get made up for it. Just the smell alone made me woozy. And when I bit into the pain epi I honestly drooled a bit on myself. Which was funny because I wasn't even hungry. Those tacos from El Berraco were still doing their job which made my next destination a bit questionable. Here's the thing: I didn't get a chance to grab a drink or any food. Pasco at 4:30pm on a random Wednesday in February was PACKED. For real, there was absolutely no room at the bar, the patio was way over crowded (I mean, it was a splendiferously beautiful day so that was no surprise) and although there was a table or two open, I felt weird being alone in that sort of upscale environment, me in grubby shorts and tattered Vans, among the late afternoon scenesters and purveyors of lunchtime gossip and wine pairings. So...I split. But I told myself I would return, hopefully with a partner and probably not as sweaty and still bloaty from the taco apocalypse I had just endured. Sorry Pasco, but good on you! Congrats on the success. I mean, the food looked good and the cocktails appeared inviting. Hopefully next time. The day was growing pretty warm, I had been driving and walking across a good portion of the city and I was so ready for a little respite and a cold beverage to ease me into the evening. Luckily when I walked into Casa Video's beer and coffee bar I was very pleased to find it full of places to sit and was gloriously air conditioned. Not too sure why it took me so long to check this place out but...I was glad I finally did. Beer and a movie? Um, yes please! Their beer selection was great, covering not just Arizona breweries but many others from the Pacific and Southwest. And there was a movie playing on the various flatscreens, Badlands, a movie I hadn't seen since I was a kid. This was great, just what I needed to end my grand day out. The bar is set up really nice too. Not only do they have fantastic beer on tap but also microbrews in bottles for sale as well. Plus they are a full service coffee bar to boot. The other bodies in the place were drinking fresh brewed coffee, but not me. I needed an ice cold beer. And I got one. An IPA from a brewery up in Flagstaff. After grabbing my frosty glass filled with golden hued goodness, I took a seat on a comfy red chair near a viewing screen and sighed deep. To quote Ice Cube: Today was a good day. The beer was amazing; citrusy, hoppy, balanced and, most important, very cold and a bit strong. Folks from the regular video store area would wander in to access the second floor area seeing as the only way there was through the bar. I watched Martin Sheen and a very young Sissy Spacek kill people across the acrid space of South Dakota while quaffing a delicious ale made a few hundred miles up a ways as kids munched on popcorn before ascending the stairs to select a fine foreign film or exploitation movie whilst on a cozy chair hiding from the beating sun and after work traffic outside. Everyone should have days like this. It makes you really appreciate the city you live in. When I was a resident of San Francisco for over 12 years I would do a "discover your city" tour at least once a month. Sometimes just jumping on a train and getting off at some random neighborhood and walking around to see what you could find. Tucson is no different. I mean, our "train" only goes a few blocks here and there but, you get what I am getting at here. And, to quote Calvin and Hobbes: There's treasure everywhere! Sure, the deli was a flop (like I said, I probably caught it on a not so awesome day) and Pasco was filled to capacity but...still. I set out to do what I had planned to do and when I went home to think about dinner and call my wife I was greeted with the fuzzy face of our cat, laying in a box and looking at me with "so when do I get a treat?" eyes. Days like this are indeed rare but when things come together, you need to just lean back and appreciate the awesomeness of the town you live in. Thank you Tucson. We shall meet again on another excursion like this. And then you lucky kids get to read all about it.